Puppy teeth care and cleaning is one of the puppy care tasks that is easy to get right, doesn't take long, and can have a big impact on Rascal's overall health. Strong healthy teeth and gums means no oral disease, no plaque build-up and lower levels of inflammation in your puppy's body. Although puppy breath is sweet, as your little guy grows it won't stay that way. However a clean, healthy mouth is the best route to fresh dog breath, at any age. Your little Rascal's deciduous teeth (his temporary, baby teeth) don't stay in his mouth very long. The last baby tooth is usually in place by the time he's around two months old, and by the time your pup is six to seven months old he will most likely have lost every one of them and have all his adult teeth in place. Check out this page About Puppy Teeth to find out more about when deciduous puppy teeth appear, how many there are, what the Teething Period is (and how long it lasts), the order in which baby teeth are lost and adult teeth grow in.... and much more. There's not a lot of puppy teeth care needed to keep these baby teeth in good shape, but it's important to work on getting your pup familiar with having his mouth and teeth examined, and his teeth brushed, during these early months. This way, each adult tooth that emerges will get proper attention from day one, leading to permanently healthier teeth and gums. What you feed your puppy has a huge impact on his overall health, and a direct impact on his teeth and gums. Firstly he needs the right nutrients to grow strong, healthy teeth. Secondly he needs a food that will help to prevent the plaque build up which is the number one cause of dental disease in dogs. The natural diet of a non-domesticated dog would be similar to that of wolves... raw meat, raw meaty bones and a small amount of greens. 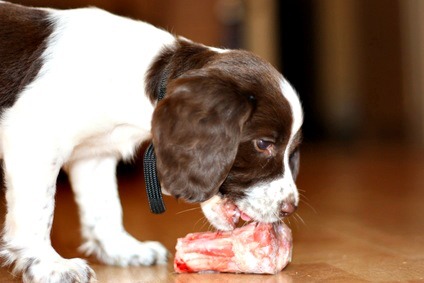 Chewing on raw meaty bones is the ultimate in natural puppy teeth cleaning, and a diet of fresh, raw meat provides the nutrition your pup needs to grow and develop optimally. It's perfectly possible to feed your puppy or dog this type of diet and my Raw Puppy Food page gives you a step-by-step guide to doing just that. It's the optimum diet for health, in all areas. But, it's not the only way to keep your puppy healthy.. either orally or overall. A premium quality, well balanced, natural puppy food combined with a good dental care routine and safe, appropriate chew toys can also keep his teeth, gums and bodily systems healthy and strong. Wet, or canned, puppy food is the least desirable type of diet in both in terms of nutritional value and dental health. Puppies LOVE toys, of all shapes and sizes. They also love to chew on everything, whether it's a toy or not. Chewing has some very important benefits as it strengthens jaw muscles, relieves stress and helps keep teeth clean and sharp. While most well-made, age and size appropriate toys are fun for your puppy, not every toy has dental benefits or is suitable for your teething puppy. The best teething toys are soft, yet firm and flexible. The gentle pressure on little Fido's gums when he plays with this type of toy can help relieve the discomfort of teething and is satisfying to him. Puppy toys with ridges or multi-textured surfaces are good for keeping teeth clean and preventing plaque buildup. Cold, frozen or refrigerated toys are very soothing for sore gums. 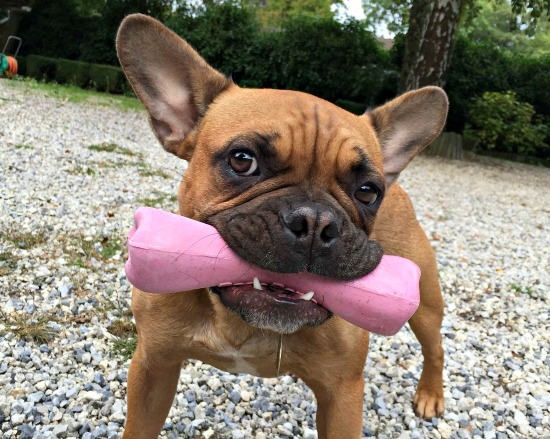 A good diet and the right toys can help keep little Fido's teeth and gums healthy, but unless he's eating a totally raw diet with a good supply of raw meaty bones you will still need to clean his teeth regularly to remove food build up and keep plaque at bay. There are lots of products available right now which make it easy to care for your puppy's teeth properly. These include dog tooth 'brushes' of all sorts (many of them don't actually have bristles), dog toothpaste, cloths, wipes, sprays and more. Choose products that are the right size for your pup and which you'll feel comfortable using. For tiny dogs and puppies a brush the size of a childs toothbrush can work, for larger puppies and breeds you want a larger head, maybe around the size of a regular adult toothbrush. A relatively short handle is easier to maneuver than a long handle. You can use 'human' toothbrushes (an adult size for large breed pups and dogs and a child size for small breeds and puppies). You want to choose the kind with a flat, level bristle surface and soft bristles. The Veterinary Oral Health Council (VOHC) suggests that only ADA Accepted, ISO Compliant human toothbrushes are acceptable. 'Finger brushes' for dogs teeth come in all sizes and are exactly what their name describes... they fit on the end of your finger, kind of like a rubber thimble. Anything that your little Rascal could potentially ingest should be natural and if possible, organic. That includes toothpaste, sprays, wipes and so on. By the time Rascal is three months old he should already be comfortable with you opening his mouth and touching his teeth (because you've practiced that with him.. see here for info. on how to get to this point if you haven't done so already). It's a good idea to keep your puppy teeth cleaning supplies in a small tub, basket or bag so that they're easy to find. A toothbrush, or selection of toothbrushes, toothpaste, wipes/dental spray, tiny treats for his reward. 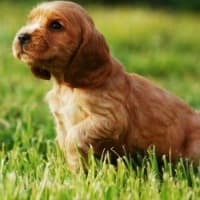 Pick a time of day when your pup is usually relaxed and calm for this activity, try to make it the same time each day. Choose a quiet area out of the way of other people, kids, pets and noise. You want your little guy to be 'chill', not distracted or eager to join in the activity around him. Depending on his size you can hold your puppy in your lap, or on a bed, sofa or chair in front of you. 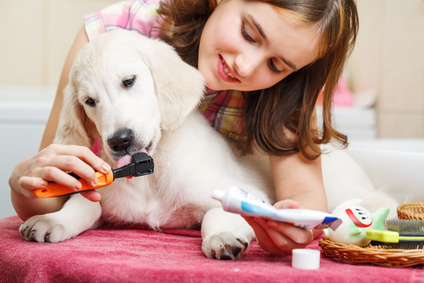 When it comes to brushing your puppy's teeth the outside surface of the teeth are most important, but if you can brush the top of the premolars and molars, and the inside of all teeth that is even better. 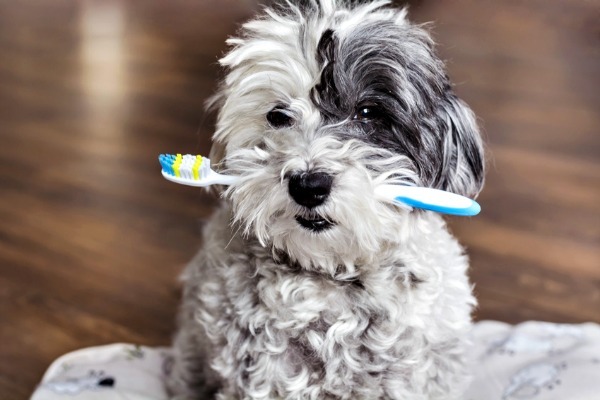 The Veterinary Oral Health Council recommends brushing your puppy or dogs teeth horizontally, with four strokes, followed by a final stroke upward, from gum to tip of the tooth. Don't press hard, gentle pressure is all that's needed. With a young puppy who still has his baby teeth this is just a practice exercise, but as soon as those permanent teeth start to grow in it becomes increasingly important. Aim to get little Rascal comfortable with having his teeth cleaned daily, but to begin with you can do this just a few times a week, then every other day, until he's totally familiar with the whole routine. Lift your puppy's upper lip at the side. Don't press or pinch it as if it hurts him he'll fight against you. Gently rub/brush the canines, premolars and molars. Working from the front to the back. Lower his lip and repeat on the opposite side of his muzzle. Then repeat the same process with the lower lip and teeth. Finally lift his lip right at the front and brush the top incisors, then do the same with the bottom ones. Praise your little guy and give him a tiny, tasty treat as a reward. .... and that's all there is to it. Yes, really! Who knew something so important could be so simple? 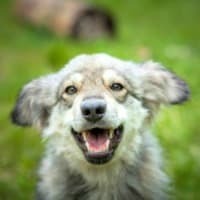 Do Puppies Need Dental Cleanings? In this case we're talking about the type of formal dental cleaning done by your veterinarian, with your pup under general anesthetic.. and the answer is 'NO'! Adult dogs MAY need a full dental cleaning if their teeth have not been properly taken care of and plaque has been allowed to build up on them or decay or gum disease has set in. 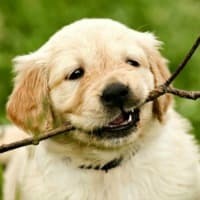 Puppies have not had the chance for their adult teeth to become compromised like this, and if you follow the recommendations on this page they never will. In fact, with the right diet, toys and at-home dental care your little Rascal should keep his pearly whites all clean, shiny, strong and healthy for the whole of his lifetime. That's worth less than five minutes a day right?